Chicken Walking Tacos is one of the most popular chicken recipes for the Instant Pot or pressure cooker, because the tacos are easy to make and so much fun to eat! 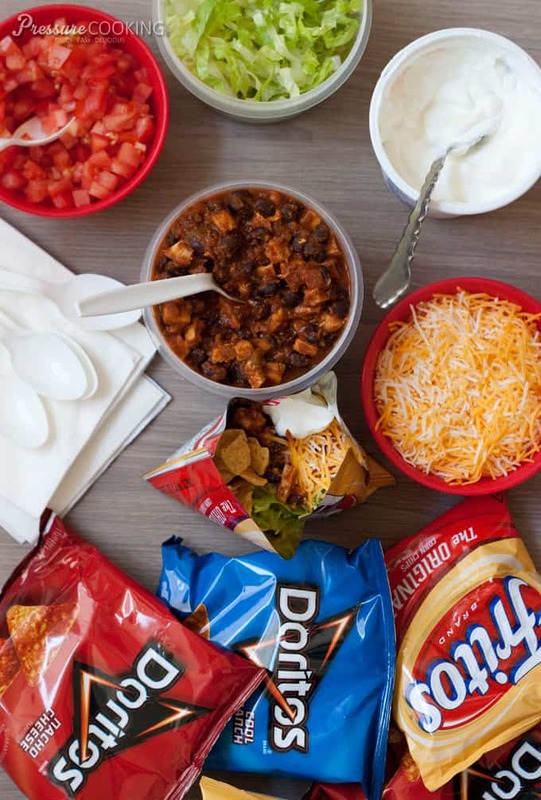 Are you familiar with Walking Tacos? They’re a fun, easy-to-make, easy-to-eat on the run taco, served in individual chip bags. An Instant Pot is one of the most popular brands of electric pressure cookers. They are easy to use and your Instant Pot can help you create these delicious Chicken Walking Tacos! Walking tacos are usually made with ground beef, but my daughter isn’t a fan of ground beef, so I decided to change it up and make Chicken Walking Tacos. Many recipes for chicken tacos start with pre-cooked chicken, but boneless, skinless chicken breasts cook so quickly in the pressure cooker, there’s no need to use pre-cooked chicken. To make the chicken walking tacos recipe extra quick and easy, I used a taco seasoning mix. If you prefer not to use a taco seasoning mix, my Easy Ground Beef Taco recipe on Barbara Bakes lists the spices you’ll need to make your own mix. If you don’t like food very spicy, use a mild salsa, if you like a little more heat, use a medium or hot salsa. My family loved these fun tacos, especially my chicken taco loving daughter. They would be perfect next time you’re tailgating, watching the game on the weekend, or any time you want a fast, fun meal. Add water, salsa and taco seasoning mix to pressure cooking pot; stir to combine. Add chicken breasts. Cover and lock lid in place. Select High Pressure and 4 minutes cook time. When timer beeps, turn off pressure cooker and use a quick pressure release. Use a slotted spoon to remove chicken to a cutting board and cut in to small bite size pieces. Add chicken and black beans to the pressure cooking pot. Select sauté and cook, stirring often, until most of the water has evaporated. To serve, open a bag of chips and crush slightly. 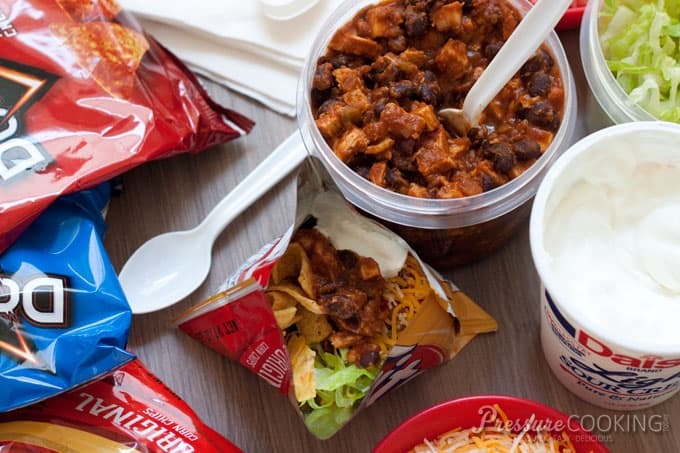 Top crushed chips with a scoop of the hot taco meat and your choice of toppings. I made this last night and it was a hit! Instead of the “walking” part, we just made taco salads with some crushed Doritos added. YUM!! My husband plans to make a Mexican omelet tomorrow with some of our leftovers. (Personally, thinking of this added to eggs kind of turns my stomach, but I don’t have to eat them!) 🙂 This would be good in a wrap too. I am so glad that I splurged on an electric pressure cooker last month. I like that I can check out your website during the day at work and have time to cook something delicious after work! Well, technically, I get home 2 hours before my husband does.. but I don’t want to spend the whole time cooking!! I’m about to use my Emeril Tfal PC for the first time. I’ve got 2 frozen boneless skinless breasts and all the ingredients to make this dish. Should I alter the time for frozen breasts? I’m so scarred to use this appliance! Hi Kerry – don’t be afraid. How about doing a trial run with just water, then you’ll know what to expect and know you’re doing it right – the noises it makes when it comes to pressure, that you’ve got the lid on just right, etc. If you’re using frozen chicken breasts, add 3 minutes to the recipe time. What a great meal. I made this last night and wow. The flavors were great, the meal was enough for 4 of us and very simple to make. Thank you for your help in my quest to find great meals for my family. Thanks Jonthon – so glad you enjoyed them! I hadn’t heard of Walking Tacos, but then again I can’t remember the last time I bought snack bags of chips, lol. However, I’ve been making DIY Taco Plate and Taco Salad for years (decades actually), using a base of crushed tortilla chips and/or sliced romaine lettuce and taco toppings and deboned shredded or chopped cooked whole chicken*. So I was way ahead of Chipotle Grill’s bowl option, lol. I guess the main difference between Walking Tacos and what I’ve been doing is the serving vessel. I don’t think the non-GMO corn tortilla chips I buy are available in single serve bags, but I do think another crunchy snack my family enjoys fairly often might be available single serve or smallish bags – pork rinds, aka chicharrones. I always choose the unflavored pork rind variety because it’s simply made from pork & salt & nothing else (& while I wouldn’t rely on pork rinds as a main source of protein, pork rinds are mostly composed of protein and the pork fat, which is mostly rendered out, is mostly monounsaturated and a traditional fat used by humans for thousands of years, just like olive oil). I’ve used crushed pork rinds as a low carb, gluten-free bread crumb substitute for the last 10 years or so, but it never occurred to me to just lightly crush them and use them as a crunchy low carb stand-in for crushed corn tortilla chips in Taco Plate. If I can find pork rinds in small single serve bags, I’ll definitely try them in Walking Tacos. If not, I suppose a disposable bowl would work just as well as a chip bag at a picnic. * I cook a whole 4-5# organic pasture-raised chicken nearly every week in my Instant Pot pressure cooker, with 2 cups water or broth, for about 20-25 min, then pull off the meat & store it in the fridge for quick meals. I put the chicken scraps and any other chicken bones, necks, backs, & gizzards saved in the freezer with any carrots, onions, and or celery I have that need to be used up (or none if not available) with more water back in the pot for 1-2 hours of pressure cooking for a ready supply of chicken bone broth. The pressure cooker method is just as good and so much faster than my previous 2-3 hour slow poach plus 24 hour slow cook method – plus the house doesn’t smell like a broth factory with the sealed pressure cooker. This method is economical, too. Less electricity, less heating up of the kitchen, and even though organic chicken costs much more per pound than conventional, a whole organic chicken cooked this way is a bargain compared to buying boneless chicken breasts & cartons of broth, and there’s far less packaging trash. The weekly whole chicken routine done at my leisure also saves SO much time later if meals need to be made in a rush. Plus it offers my teenager something nourishing when he’s surveying the fridge for an EZ quick snack. Also, my husband and I prefer dark poultry meat over white meat, but our son prefers white meat, so a whole chicken makes everyone happy. I cook a weekly or every other week batch of .5 -1 # of dried pinto beans, too, for refried beans (tacos, nachos, tostadas, dip, etc.). Keeping these staples stocked in the fridge makes feeding a ravenous teenage boy SO much easier. Hi Anna – thanks for sharing all your tips. I’ve been after my husband to buy a second freezer so I’ll have more room to stock up. Such great ideas.